This game is by invite only. The waiting list is being maintained at the BSG PBF Wiki. 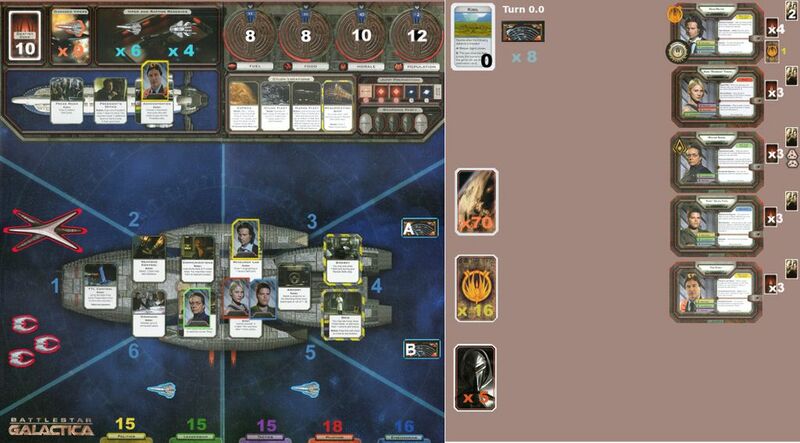 This will be a five player base game to Kobol. No expansions will be used. Thanks to ColtsFan76 who kicked things off way-back-when and to those who have created and maintain the tools I will be using to mod this game. Special thanks to my previous moderators who with their skill have encouraged me to try. In order to participate, you must own a copy of game. This is a requirement by FFG. Use normal text for any discussions. Please Bold any moves, actions, and decisions you are going to take. I will process nothing unless it is bolded. Use Italics for in-character/flavor talk. In-character talk is heavily encouraged and makes the game much more entertaining. Private communication will be done via geekmail between me and other individuals. All other communication should be public in the thread. There should be no private messaging between players. If you have a question, go ahead and send me a geekmail. Messages to me should have a subject line of BSG 440 (Character Name). As this is a PBF, all information is recorded. In the spirit of the game, I will request that no one look back more than one player turn if you need to refresh your memory. Please do not copy and paste skill check results. Use the banners for your character when posting. Banners and any images you wish to use are located here: http://boardgamegeek.com/geeklist/item/1834905#item1834905. Many thanks to Gerryrailbaron. Please subscribe to this thread, and try to check in at least once a day. The subscribe button is located near the top of the page. If you are going to be absent for an extended period, please post in the thread or let me know so I can react accordingly. Pass on all interrupts I don't have in my hand. * on Launch Scout unless there is only one raptor remaining. * on attacks by vipers or attacks by cylon ships. Pass on Evasive Maneuvers unless it is the last ship protecting a civilian or a manned Viper. You have a right to change any of these CO's if you wish, but you'll need to let me know via geekmail. * Talking about scouted cards (top or buried) beyond "good" or "bad"
That all being said, I am still human and will make mistakes and this will be my first Moderator game. Please be forgiving, as I will try to correct them as soon as I see them. Don’t hesitate to ask me if you have any question and please tell me if you notice any error. Count me in, thank you for running it. Challenge accepted! Looking forward to it. I'm in if you need me! I am going to roll for character selection order and so you can start choosing or at least start thinking about it. You can send me a CO for your character selection, CO for the game and your starting 3 cards draw (except TheNameWasTaken) if you want. It's been quite a while since I last got to be President, so I pick Dr. Baltar. Titles are for other people. Think I'll go with Chief Tyrol. As the last pick I will take Tom Zarek. Since order probably won't matter, 2 blue, 1 green for the Chief? I'll take 1 each of Green, Red and Purple. Almiral Adama I need your starting draw. Loyalty cards sent. Starting hand will be sent as soon as I got that info. Edit: I am sending the loyalty cards, no need to wait. And, of course, Admiral Adama. "Dradis Contact! Multiple signals; none broadcasting colonial FOF frequencies! I think the Cylons found us!" Please post your move and action when ready. Move: discard 1 - Consolidate Power to move to President's Office. Action: activate the President's Office to draw 2 Quorum cards. Send in your COs for Declare Emergency if you have not already. President Baltar first of all, I need you to post your Intuition card draw in the forum. What are peoples thoughts on this? Given Baltar's drawback, I don't think there's any point in going for the partial pass, we should either aim for the pass or tank it. I can help a bit if we want to try passing it. I wonder what Zarek has to say about this. They're his people, aren't they? I am doubtful about passing this one. *On the phone* "Yes, it's going as planned. With any luck our 'dear' President will have to give up his throne. The prisoners? Collateral damage. Regrettable, but necessary." My contribution to this check, even with my whole hand, would be fairly low. We'd need to basically empty our resources to guarantee a pass on this without an IC, and I don't really see it as worth it. If nothing else, we can at least mitigate the risk of a cylon president somewhat.